KEW ENGG. & MFG. PVT. 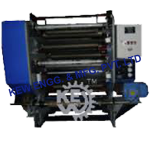 LTD. is a Leading Supplier & Manufacturer of Foil Slitting Rewinding Machines, our product range also comprises of Roll Slitting Rewinding Machines, Film Slitter Rewinder Machines, Drum Type Slitting Rewinding Machines & Paper Slitter Rewinder Machines.